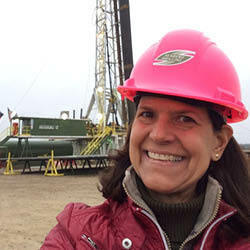 Denise Cox, President of Storm Energy and President-Elect of the AAPG, loves geology and wants to let a global audience understand more about the role of geoscience in energy solutions. From mucking around in the mud in her backyard as a toddler in southern central New York, she rapidly progressed to hiking the tree-covered glacial hills around her home and to exploring the Devonian outcrops of the Finger Lakes region. When she wasn’t outside she had her nose in a book, her other favorite pastime, exploring other continents and other times. 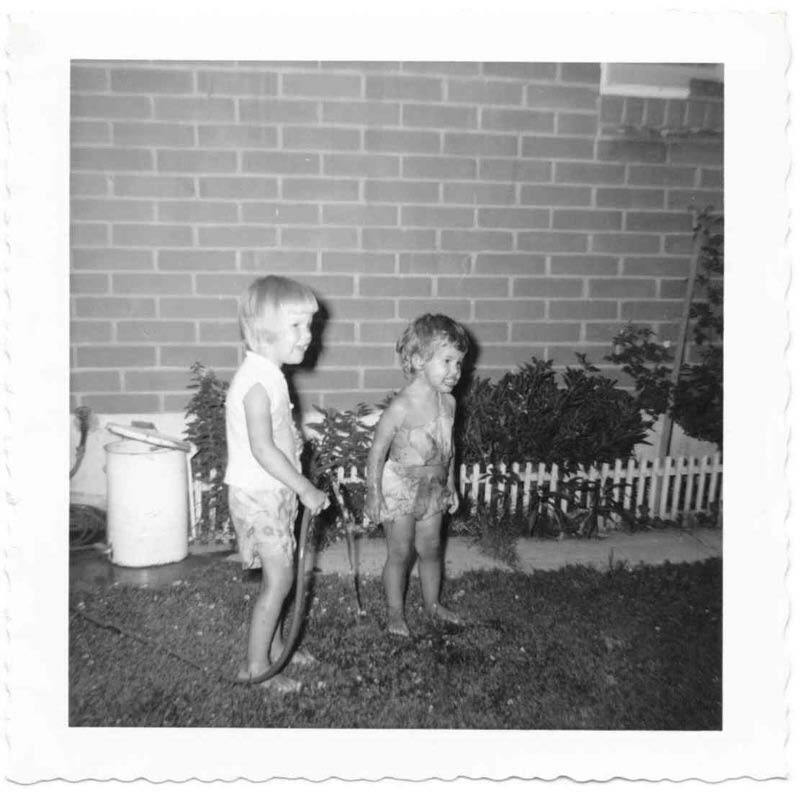 An early interest in mud rock! Photo credit: Denise Cox Coming from what she describes as “very modest roots”, Denise was of the first generation in her family to go to university. It was not until her second year at the State University of New York at Binghamton that she took a class in geology – and even then, it was only because in her first year she balanced the science and math subjects at which she excelled with an elective course in Arabic; it was her Arabic professor who recommended she tried geology. Almost immediately, she knew geology was what she wanted to do. 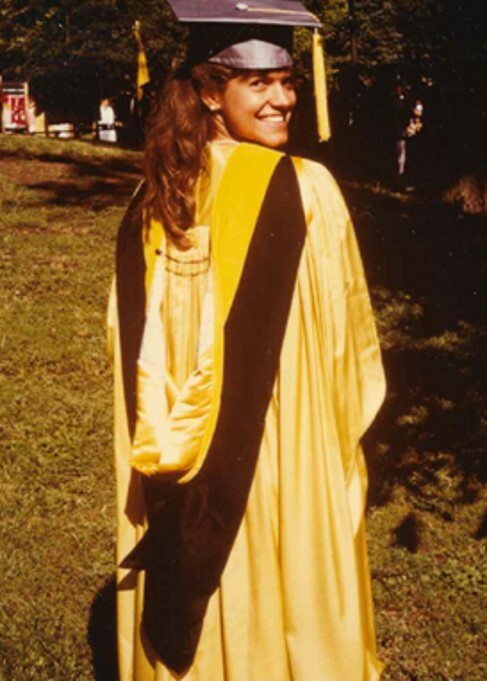 Denise graduating from Colorado University in 1985. Photo credit: Denise Cox. 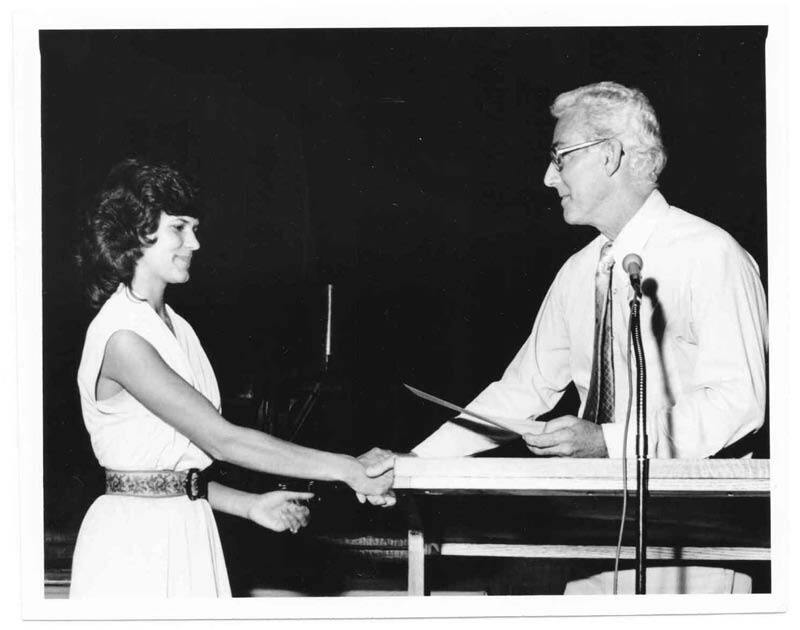 Despite her late start in geology, Denise graduated with an Honors BS in the subject and was awarded the Glenn G. Bartle Award for excellence in geology. Her career began as a technician with the US Geological Survey in Denver, Colorado on a 9-well Uranium and Thorium coring project. She soon realized that to have a career as a geologist, she would need a further degree. She attended the University of Colorado, Boulder, a perfect choice of location given her interest in the outdoors, and took a masters in geology, which included courses in petroleum geology and a thesis on the diagenesis of the Permian Capitan Formation in West Texas. Whilst completing her research she was also working part time as a reservoir geologist at Marathon Oil’s Denver Research Center (DRC), where she further developed her interest in carbonates. After graduation in 1985 this led to a full time offer of work at the DRC and ultimately a 20-year career with Marathon, in Denver and Midland and Houston, Texas where she specialized in the application of new technology to carbonate petroleum reservoirs and later the evaluation and development of unconventional reservoirs. Denise provided some insight on making connections at work. “When I started a new job I would do ‘rounds’, finding out what everyone’s role was in the group and what were their processes – types of maps, cross-sections, analyses – for exploration or development. Because of this I knew what person A was doing and how it might help person B, if only C would provide the data.” This proved very useful when the exploration industry began to introduce less rigid subject-led management structures, and probably resulted in Denise being chosen to lead one of Marathon’s first multi-disciplinary teams. What else would Denise suggest to young people starting out in the industry? “To those already working: don’t be afraid to say, ‘I don’t understand’. Accept and learn from your mistakes – we all make them. I’ve drilled my share of dry holes; the important thing is to understand why, so the next well gets drilled and is a success. 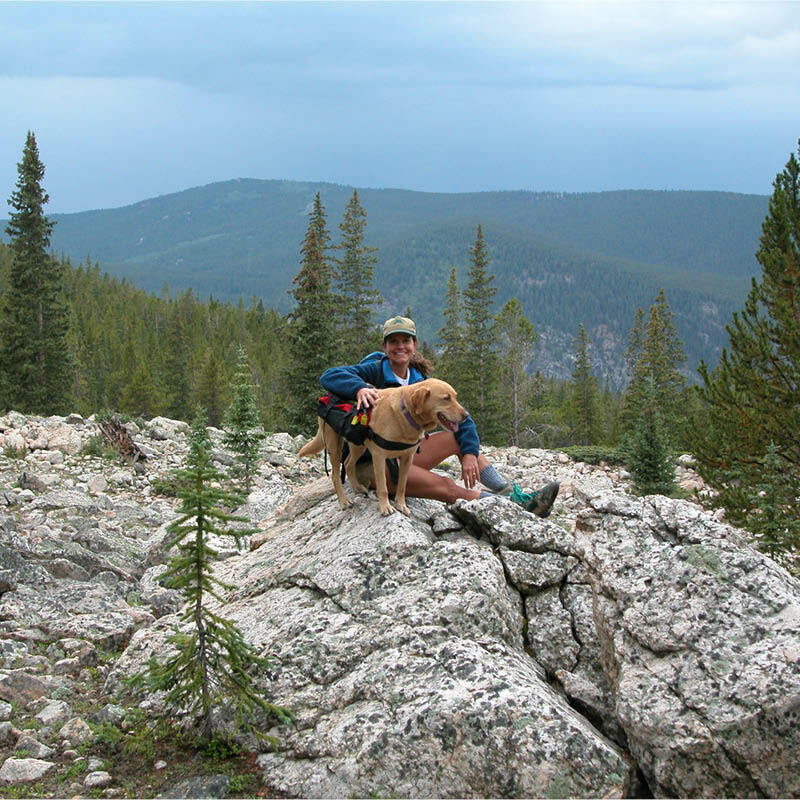 Unplugged and hiking with Maggie in the Colorado mountains, 2002. Photo credit: Denise Cox. “Also, try to take all the experience and leadership opportunities offered to you. You may not feel you are ready for a transfer or management role, but if someone approaches you with one, it is because they’ve seen technical or leadership traits in you that mean you ARE ready. “To undergraduate students I would suggest that they get the best fundamental geoscience education that they can at a college or university which has the best connections to the industry where they want to work. Good choices lead to good choices.” Denise adds: “If possible, take courses in data analytics and geostatistics; these are really important to have on your resume in today’s job market. In 2004, Denise decided not to permanently relocate to Houston when Marathon consolidated their production offices there. She joined her husband, Kurt, also a geologist, as a technical consultant for Storm Energy, the company he built through an acquisition and successful prospects. They moved to Panama City and she now heads up the company, as Kurt has a new career as a writer. Denise likes to refer to herself as the ‘spatula’ of the oil business – she likes to get the last drop of oil out of existing oil fields. “While I was happy in the corporate world, and had corporate management aspirations, there are a lot of advantages to my role as a small independent. I love the strategic side of the business, and the fact that we make our own policies – such as moving the office to Colorado for a couple of months every year, to unplug, go back-packing, and hunting for something other than oil.” Among her many interests, Denise is also an avid wild mushroom collector. AAPG President-Elect, Denise Cox. 3rd Female President in 100 years. Photo credit: Denise Cox. 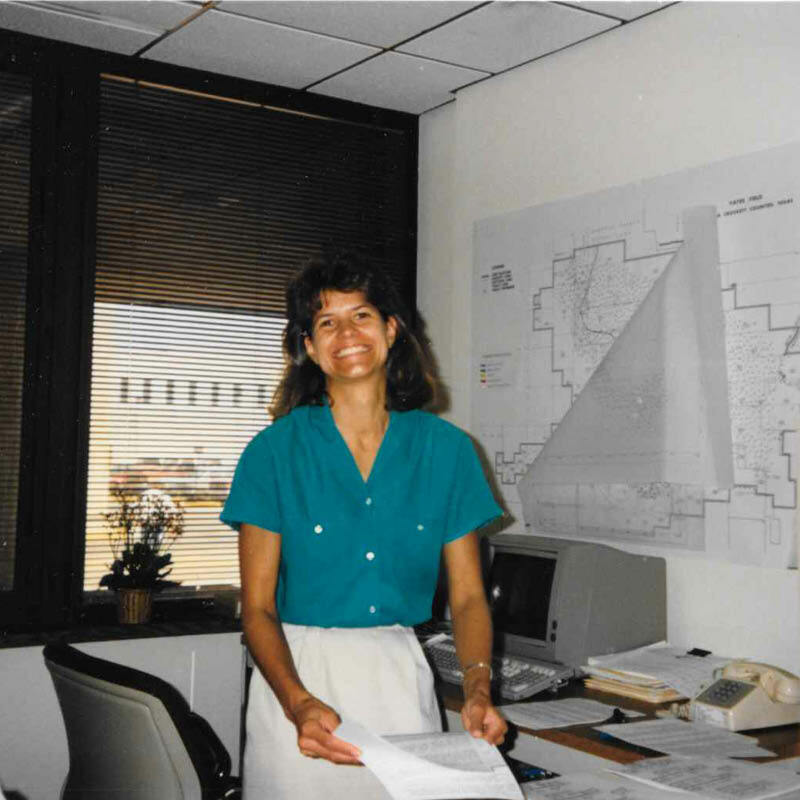 Denise has always been active in professional societies such as the American Association of Petroleum Geologists (AAPG), Association for Women Geoscientists (AWG) and the West Texas Geological Society. She was President of AWG in 2014–15 and is at present President-Elect of AAPG, due to take up the presidency in July this year – only the third woman in the 100-year history of the society to have this role. I ask why she decided to stand for election to this prestigious post. “Firstly, because I was asked, and as I said, my advice is not to turn down an opportunity to lead,” she replies. “Also, I love what I do, so this role gives me a chance to communicate a global perspective of geoscience and the importance of the petroleum industry in energy solutions. The AAPG is US-based, but importantly has Regions in Africa, Asia-Pacific, Canada, Europe, Latin America and the Caribbean, and the Middle East; AAPG truly has a global reach. After all, geology crosses borders; it is a systems science, not a geographically-bound one. For example, there are Paleozoic geological systems throughout the world and we can benefit from the knowledge of petroleum systems say in the Permian of West Texas compared with the Southern Permian Basin in Europe. 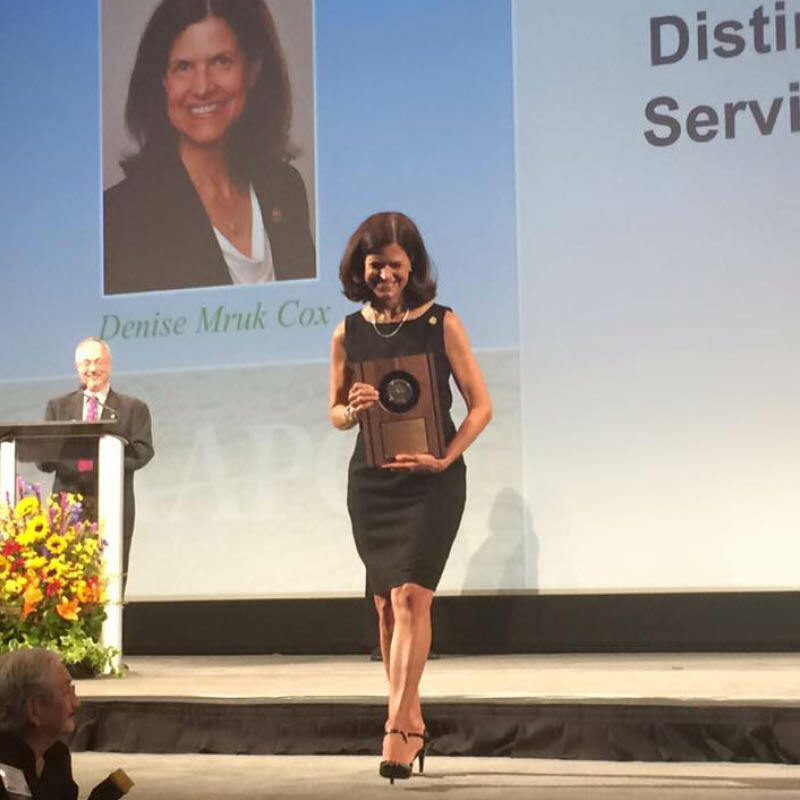 Denise Cox receiving "Distinguished Service" aware in 2015. Photo credit: Denise Cox. 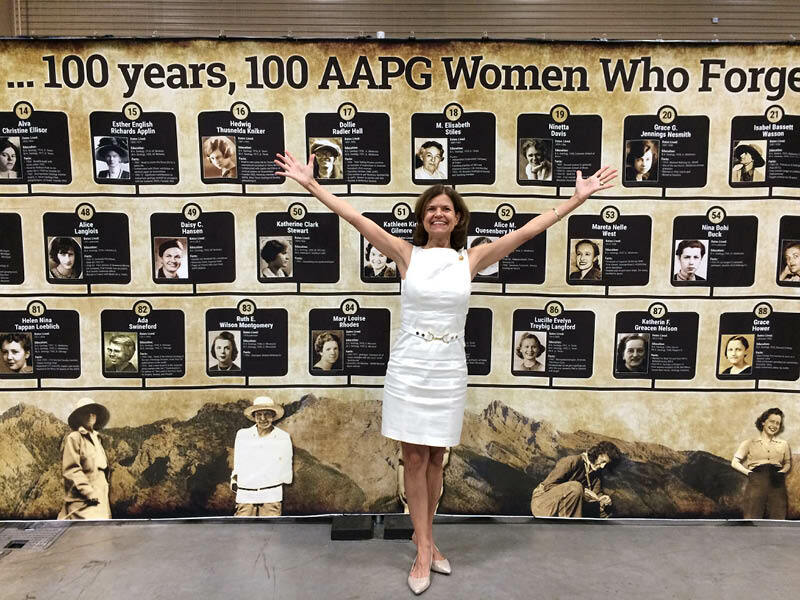 “I also agreed to stand for AAPG President because I get to connect with current and future members,” she continues. “It’s great to realize how many people are working on energy solutions at any time, somewhere in the world! On a recent AAPG trip to the Middle East I was impressed by the talented and well-spoken men and women I met. They understand their crucial role as geoscientists in the petroleum industry and are passionate about providing new ideas to explore for and develop low cost, reliable energy. The women were particularly interested in career options, so they were pleased to see a woman in a prominent leadership position. Denise as AAPG Secretary, with Charles Sternbach, DPA President, connecting with students at AAPG’s International Convention in Singapore 2012. Photo credit: Denise Cox. “Like many people, I want to give something back,” Denise says. “I was keen to participate in organizations like the AWG because I was the recipient of a Chrysalis Scholarship to help finish my masters, so I know how vital these funds are. As a past Chair of the AAPG Grants-in-Aid Committee, I also established a scholarship in my family’s name, ‘the Mruk Family Grant’. We need to make sure that scholarship funds are available so future geoscientists can answer some of the questions that we’ve yet to address. “I know I’ll never have enough time to do everything that interests me, but if I’ve made enough connections to have made a difference – then I’ll know I’ve helped the next generation to ‘go forth and make the world a better place’,” she concludes. Previous President of the AAPG: Lee Krystinik. Previous President of the AAPG, Dr. John Lorenz, speaks of the lack of public data available to oil & gas professionals. 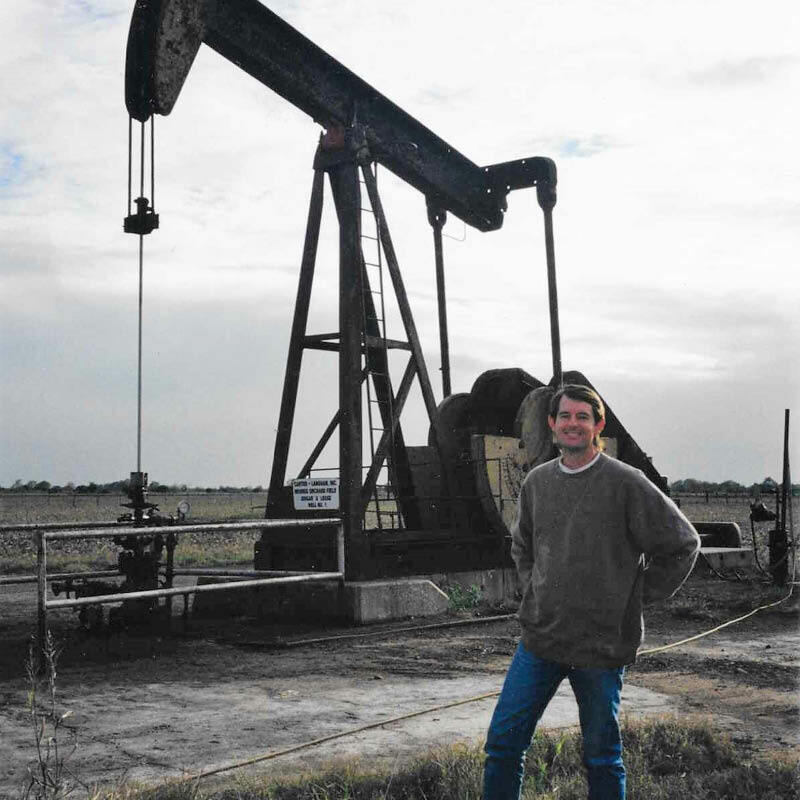 Previous president of the AAPG, Ted Beaumont, reviews oil & gas in 2012 and 2013. It all began in 1917, 100 years on - read all about the global organisations 100th birthday celebration in 2017! Christian Höcker spent over twenty years with European super giant Shell, where he witnessed many changes, before moving to a completely different working environment in small start-up company JOA Oil and Gas. Having experienced the hell of civil war, Dr. Ibrahima Diaby, CEO of Côte d’Ivoire’s state oil company, hopes that exploration for oil and gas will help his country to grow and develop.